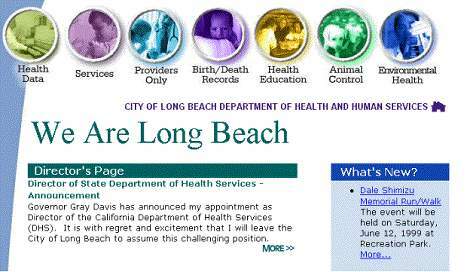 The Long Beach Health Department web site, www.ci.long-beach.ca.us/health, was redesigned to be functional, easy-to-use, and easy to maintain by Department staff. The underlying purpose for the site was to increase their visibility in the community and to provide the community another avenue to find information easily. Added to the existing site functionality was the ability to order and pay for birth and death records. Pet licenses and Pet-of-the-Week adoption services are to be added at a later date. The web site is also used on the Department's Healthy Touch Kiosk Network.